The Hausmann Quartet has established itself as an integral part of the cultural life of Southern California since its arrival in San Diego in 2010. As faculty Artists-in-Residence at San Diego State University they teach and organize the chamber music program, engage in interdisciplinary collaborations with other departments and visit local schools for concerts and clinics on behalf of the School of Music and Dance. 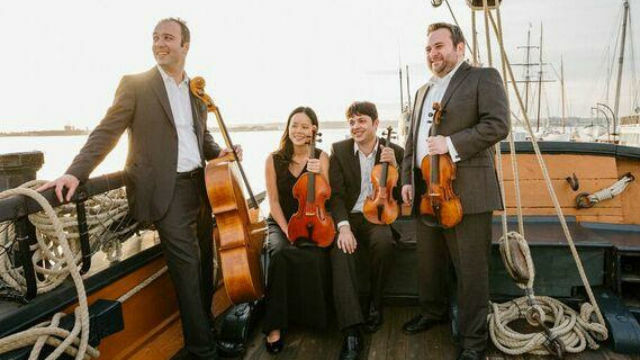 Their latest endeavor is Haydn Voyages: Music at the Maritime, a quarterly concert series on a historic ferry boat exploring the string quartet repertoire through Haydn’s quartet cycle. They pioneered interactive programs for students, adult amateur musicians and local seniors and homeless as Ensemble-in-Residence at Mainly Mozart with support from the Irvine Foundation, National Endowment for the Arts and ACMP. Founded in the summer of 2004 at Lyricafest, they have recently been hailed as “Excellent” by U-T San Diego and “an accomplished young foursome with a luscious sound and an experimental bent” (Repeat Performances), and maintain an active performance schedule throughout North America and Asia. The members of the Hausmann Quartet are violinists Isaac Allen and Bram Goldstein, violist Angela Choong and cellist Alex Greenbaum.